Soak up the history with a fascinating break in Colmar with Premiere Classe hotels. Colmar is a charming city in the Alsace region of north-east France. Situated along the Alsatian Wine Route, the town considers itself the Capital of Alsatian Wine as it has a microclimate that is perfect for Alsatian wine grapes. Colmar is equally characterised by its beautiful architecture. As the city managed to dodge the destruction of the French Revolution, the Franco-Prussian War and both World Wars, visitors can find architectural features in Colmar spanning eight centuries of Germanic and French tradition. Founded in the ninth century, Colmar was made a free imperial city in 1226. The city was finally conquered by the French in 1673, but was annexed by the German Empire in 1871 as part of Alsace-Lorraine. It was then returned to France in the Treaty of Versailles following WW1, annexed again by Nazi Germany n 1940 before finally reverting to French control in 1945 after the battle of the ‘Colmar Pocket’. 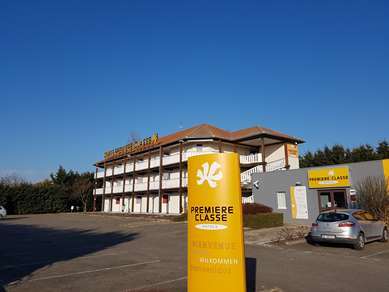 With Premiere Classe Hotel Colmar Nord – Houssen less than 15-minutes drive from the town centre you are well placed to explore this lovely city. Visit the Musee d’Unterlinden (under the linden tree) to see a vast array of paintings and sculptures. Its collection includes the Issenheim Altarpiece. You’ll also want to spend some time strolling round Colmar taking in the architecture, not least in the area now known as Little Venice, an area that used to be the butchers quarters. The Eglise des Dominicains is a beautiful church in central Colmar that houses Martin Schongauer's masterwork La Vierge au Buisson de Roses, but the city’s biggest church is Eglise Saint-Martin. The church features several Gothic and Renaissance sculptures and altars. Visit Colmar’s Bartholdi Museum and learn about the man who designed the Statue of Liberty, a replica of which stands outside the town. The Petit Train Touristique de Colmar runs every day from 9am to 6.30pm and is a great way for a family to see the town and some of its most important sights. The train provides you with audio guides and is a very reasonable price. Colmar’s covered market is a must see and is a great chance for a family to soak up some truly French atmosphere. Beyond that it is a great place to pick up fresh food for a day’s picnic or just a snake. While in Colmar there is a bus service that makes it easy to get around and will take you to a lot of the surrounding area. The regional Colmar Airport serves the city, but the Gare de Colmar also has connections to Strasbourg, Mulhouse and Zurich among other cities. The Alsace as a region is known for its pastries, particularly the Kugelhopf which is similar in shape to the American Bundt cake. Tarte Flambee is the Alsatian equivalent of pizza, though it is very different, being made from a dough base covered in crème fraiche, cheese, onion and bacon. The Alsace is also famous for its pretzels. Since 1980 Colmar has played host to an international summer festival of classical music called Festival de Colmar, or Festival International de Musique Classique de Colmar. The festival usually runs for the first fortnight of July and every year it is based around an original theme or concept to help ensure that the festival remains fresh and vibrant. The cityscape of Colmar, and that of its neighbour Riquewihr, were used as the basis for the design of the city in the Japanese animated film Howl’s Moving Castle. In fact, if you stroll past the Maison Pfister you might notice that the building is drawn in the film exactly as it is in real life.